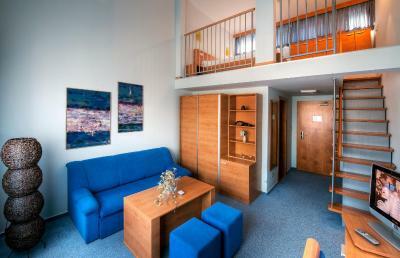 Lock in a great price for Hotel AquaCity Seasons – rated 8.6 by recent guests! Being able to pay for late check out with use of all facilities for just €20. 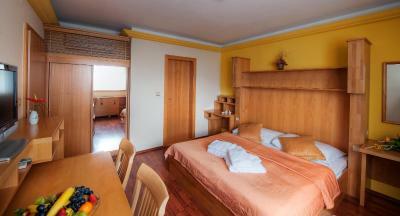 Average room basic furnishing comfortable and clean decent bathroom. Coffee and teas making facilities. 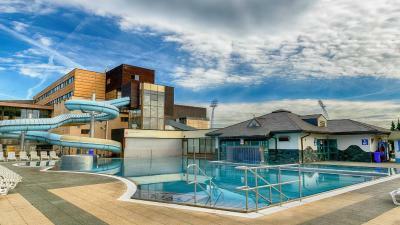 Large spa, we thoroughly enjoyed the indoor pool with the pool bar and The two outdoor mineral pools. The slides and other outdoor facilities where closed. Wifi was good. We had a DBB package, dinner was nothing special it was very disappointing. Breakfast was much better. The food and service in the restaurant was good.The aqua park was pleasent but we did not have time to enjoy it to much. This is a very nice place. The price includes visits to thermal pools and wellness areas. 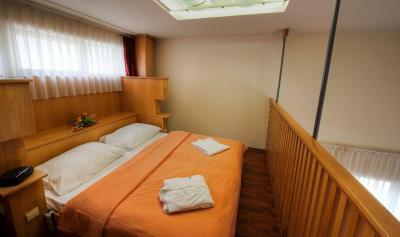 The staff is friendly, the rooms are clean and comfortable. Meals for breakfast and dinner are delicious. Waiters and administrators speak English and understand Ukrainian. 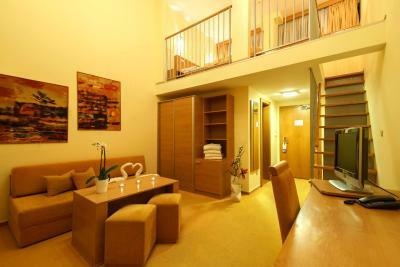 The swimming pools were lovely and the room was good enough. We loved the saunas as well. Was nice wiew from the outside pools. The food was delicious but not so many choices. The receptionists were kind.Actually all staff was nice. The aquacity was great! I would recommend this hotel! Good breakfast. So many different types of pools and things to do in Aquacity. The service of the staff was very kindly and polite. The internet works good In the rooms. Big water park with 3-4 different pools. Magnificent and outstanding sauna world with 7 saunas include sauna shows, next to the saunas there's nicely pools. Hotel AquaCity Seasons This rating is a reflection of how the property compares to the industry standard when it comes to price, facilities and services available. It's based on a self-evaluation by the property. Use this rating to help choose your stay! 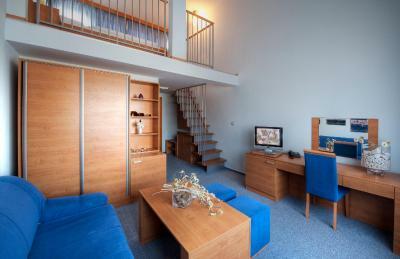 One of our top picks in Poprad.Arranged over 2 floors, the hotel is part of AquaCity Poprad and has already won awards for its style, comfort and affordable rates as well as its ecological practices. 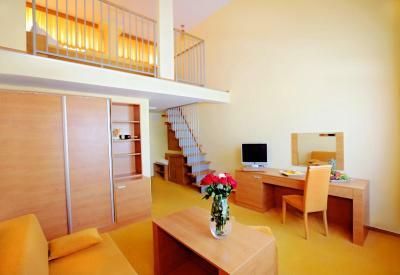 Voted as Slovakia’s best hotel in 2005, there are no compromises when it comes to offering guests a pleasant and relaxing place to stay. Many people choose to come to AquaCity in the winter in order to combine a great skiing and winter sports vacation, with the opportunity to relax in heated pools, spas and saunas after a hard day on the slopes. 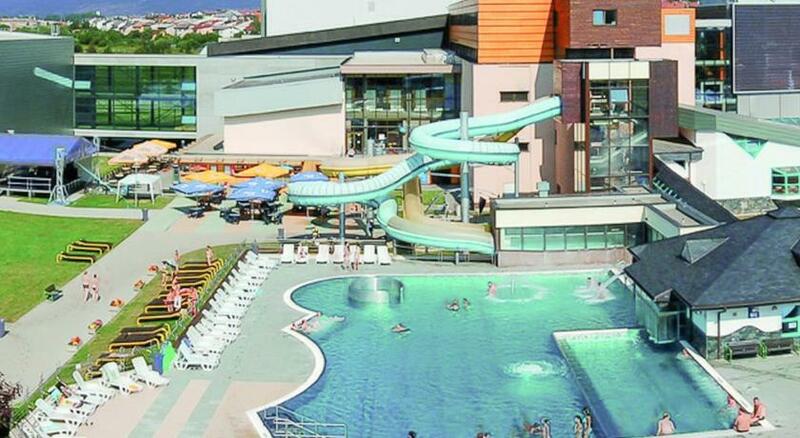 In summer guests come just to enjoy the hotel's water park and the luxury of the hotel and its surroundings. However AquaCity has more to offer than just itself. Set in the stunning landscape of some of the most awe-inspiring scenery in Europe, you will find many activities right on the hotel's doorstep. 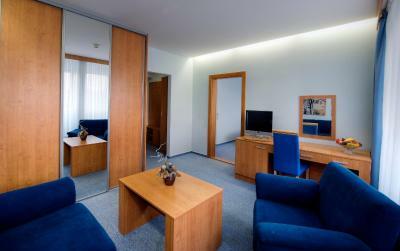 When would you like to stay at Hotel AquaCity Seasons? 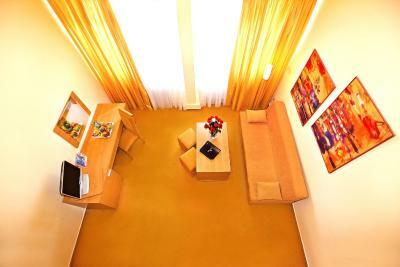 Room decorated in green, yellow, orange or gray, according to the seasons. 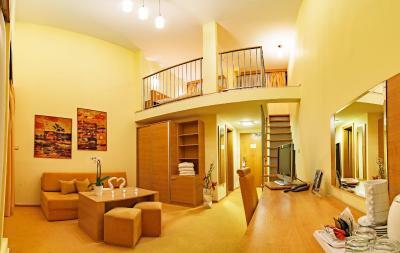 This suite is spread over 2 floors and it comes with a living room with a sofa and a private bathroom. House Rules Hotel AquaCity Seasons takes special requests – add in the next step! Hotel AquaCity Seasons accepts these cards and reserves the right to temporarily hold an amount prior to arrival. Weak Wi-Fi in my room. No problem with connection in restaurant or lobby. Very good breakfast. Only instant coffee. There was no air conditioning during the night a bit hot .The railway network too close to the hotel and very noisy could not sleep well. Dinner was not great and the food could have been warmer. There was no aircondition in the rooms, it was hot during nights. The railway network is too close, a train passed by in every quater-hour during nights. Under these conditions our stay in this hotel was not relaxing at all. Great hotel in a beautiful location. Very good value for money. Helpful staff. Excellent pool and spa facilities. No water in the tap. Terrible food.